Mix active yeast, sugar and a handful of Tipo 00 flour in a large bowl. Cover the bowl with a tea towel and let rise until doubled, about 30 minutes. Place the flour on a board or in a bowl. Make a well in the center and add the egg, melted butter, some salt and the yeast into it. Add the mashed potato and knead it using your hands until obtain a smooth and elastic dough. Sprinkle some flour on the dough, cover it with a tea towel and leave it rise for approx 1 hour. Heat the olive oil in a medium saucepan and gently cook the garlic until softened. Add the tomatoes, sprinkle some dried oregano and simmer it for a few minutes. Divide dough into 3 pieces. Grease your hands with olive oil. In a lightly greased baking tray, pat the dough into 1 inch thick circle. 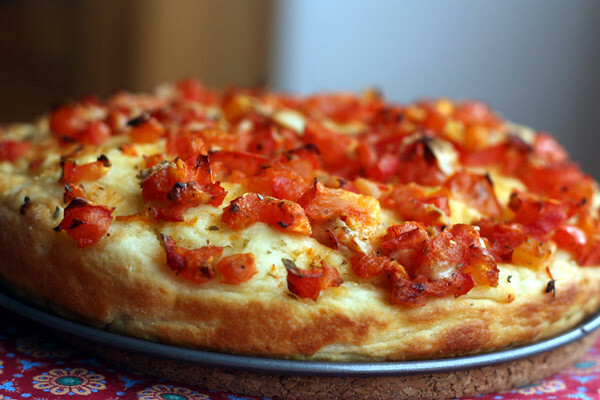 Cover the dough with the tomato topping, sprinkle with Parmesan cheese, dried oregano e a drizzle with olive oil. Sprinkle it with more chopped garlic if you wish. Bake in preheated oven at 180°C for approx 1 hour, or until the bottom is golden brown. Repeat the process with the other 2 pieces of the dough. WHEN DO YOU USE THE MILK ? WHEN YOU KNID THE DOUGH?